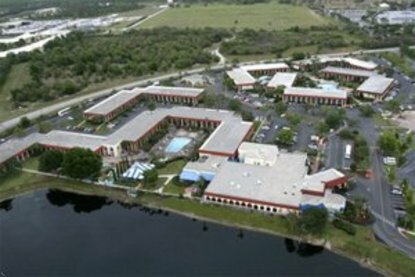 Great location, great amenities at a great value - this Orlando area hotel is located just outside the Walt Disney World Resort. The Best Western Lakeside in Kissimmee, Florida offers full-service, deluxe resort amenities at a great value with easy access to Walt Disney World and other Orlando attractions. Hotel amenities include three pools and two children's pools, an extensive exercise facility, arcade and an on-site miniature golf course. Guests can chose from multiple restaurants and eateries on site, plus the hotel offers a kids eat free program-contact the hotel directly for details. The hotel offers daily, regularly scheduled courtesy transportation to the Walt Disney World resorts, Universal Studios - Orlando and Sea World. Hotel accommodations set in warm tropical and Mediterranean d?cor include cable television, in-room coffee/tea maker, refrigerator and free high-speed Internet access in all rooms. The friendly and courteous staff is happy to accommodate any type of special event, business meeting or family reunion in the hotel's spacious meeting and banquet facilities with catering services also available. Kissimmee and the Orlando area has more to offer than close proximity to local amusement parks and resorts The area is also host to the annual Daytona 500, Firecracker 400, Bayhill Golf Classic and the Disney Golf Classic. Guests can also enjoy local outlet shopping, sporting events and Disney's Magic Music Days. Special rates are available year round, so make an online hotel reservation today Save with a low rate guarantee from Best Western.